Menopause is a natural part of a woman's aging process. During menopause a woman's ovaries produce lower levels of the hormones estrogen and progesterone and she is no longer able to become pregnant. The changes leading up to menopause can occur over many years, with the average age for menopause being around age 52. Changes can, however, begin to occur in the early 40's or to the late 50's. Perimenopause refers to the several years before menopause when a woman experiences the initial signs of menopause. How Does Menopause Affect Migraines? For women whose headaches have been triggered by menstrual cycles, the lack of periods following menopause can result in a noticeable improvement in headaches. Aging can be associated with headaches becoming less severe and in fact, some women may find that their headache pain is less severe during and after menopause. Unfortunately, not all women will discover that menopause improves their headaches. For some women, migraine frequency and intensity may increase, particularly during perimenopause. 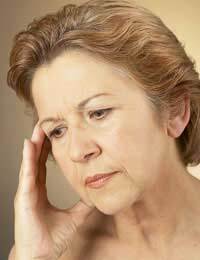 Migraine headaches may become more severe just prior to menopause and this is related to hormone fluctuations. During menopause, the levels of 'female' hormones decline and migraine headaches frequently decrease. It is thought that these changing levels of hormones trigger migraines for some women. For women who already suffer from migraines, they may find that previous treatments, drug or otherwise, are no longer effective. This can be particularly stressful during a time when women are adjusting to various hormonal and emotional changes. Due to the major role of hormones in menstrual migraine, one treatment method is through the use of hormone replacement therapy (HRT). HRT may be prescribed during perimenopause and then continued through the entire menopausal transition. The key therapeutic aim of HRT is to treat the uncomfortable symptoms of menopause, such as hot flashes, depression and anxiety. The benefit of migraine reduction from HRT is therefore in addition to the other common aims of HRT. Women who decide to use hormones might also wish to consider a consistent dose regiment to help them to avoid migraines resulting from a cyclical pattern of use. There has been some controversy in recent years surrounding the safety of HRT and it may not be appropriate for all women. It is recommended that you discuss any benefits and concerns about HRT with your healthcare provider. Phytoestrogens are plant compounds similar to estrogen. There are various ways to ingest these compounds such as through food sources which include soy or herbs such as black cohosh. Supplement products containing isoflavones, a component of soy, are widely available and can be purchased as capsules or shakes. One study suggested that a combination of soy compounds, dong quai, and black cohosh was associated with a lower risk for migraines but other studies have found no link. In fact, some studies have found that phytoestrogens may even exacerbate migraines and as such, it can be very confusing for women to choose a migraine treatment during menopause. Ultimately, women may best be advised to keep their hormone levels as steady as possible during menopause. The process of relieving migraine headaches during menopause is similar to general migraine treatment advice: find what works best for you. It may require trial and error to identify triggers and find a dose regimen with HRT or supplement with phytoestrogens, if at all, that works. Less time worrying about migraines means that you can focus more on the enjoyable aspects of the 'middle years' of life. Wow, I am so glad I found this page. About 3 years ago whilst at work, I felt a pop in my head followed by a whooshing sensation. The vision in my right eye went kaleidoscopic. This lasted for less than a minute but afterwards i felt nauseated and had a very horrible pulsing sensation deep in my head. PANIC, i thought i was having a stroke or a bleed on my brain. I called 111 and was advised to see my GP asap. The GP diagnosed ocular migraine and gave me medication. This didn't work and the pain and pulsing sensation lasted several weeks. I had numbness and could only relieve the pulsing by laying with my head on a cold cushion. I had a further 4 'episodes' all lasting around 6/7 weeks with a break of about 3/4 months in between. After having mri scans and seeing a consultant neurologist, I was advised that the symptoms were atypical of migraines and was given medication. A wonderful lady GP read my letter from the consultant and read my history and suggested it could be linked to the menopause. Fast forward to now and I am taking HRT and antidepressants. When my HRT is at the right level I don't get migraines. Looking back I was 40 when i started getting feelings of pressure in my head leading up to the pop when i was 45. I also had severe night sweats and feelings of panic. I am now a lot more chilled but still get night sweats and am hoping it all ends soon. I am a completely different person..
@CarryWarry - Oh wow - thanks for this. I have had a continual headache since menopause, having never suffered previously in my life. I finally relented and acknowledged I have begun to go through the menopausal stage. Iam missing my cycle already, it made me feel flushed out and clean, ready for another month's worth of life. I hope they haven't left me completely, I would like say goodbye. I have always strived to have reached the peak of my wisdom by this time of life. Although my vanity has enabled me to maintain a certain degree of youthfulness and pride, I want to earn the respect of this "Old Hag Stage.". Aaah, The Old Hag. The wise woman, the third stage of the Feminine. .
Hi, I can relate to your migrane problem. How are you now? as I see your post was 2011. I am 43 and had a hysterectomy when I was 38 and been on Everol HRT patch 25 mg since, but this week due to bouts of depression and feeling unwell all the time, have come off it. I have had a migrane for 2 days now, which is a regular occurance, will prob last another day. I have just ordered some black cohosh and feverfew.Did it help you? Hope you are better. i suffer with migraine myself which makes me feeling very down and weepy, when i was younger i used to get sometimes headches with my monthly periods which weren't migraine just normal headaches. When my periods stopped at 53 years old these horrible migraine like headaches came on and my doctor said they were hormonal migraines caused by the menopause. That was about 10 years ago now the migraines have got less but recently i had a bad dose of it and i have just got rid of the pain etc today really. I went to bed for a few hours it stopped but next day it was back again i take pain killers but they don't always work really the worse symptom is the buzzing sound in my ears and head and i feel very dizzy sometimes and sick. and i am going mad, I haven't had a bad migraine for months and had to go to bed but this one laid me low sorry to say. Perhaps the fact that i get sleepless nights and feel stressed because of that doesn't help really. I was taking feverfew tablets but stopped taking them because the migraine was much better but i think i will return to them and see if they get rid of the problem altogether, i try to keep positive as much as i can which isn't always easy. A friend has said drinking water often helps the migraines so i will give that a try too. Anyone who suffers migraine i can relate too, when people say it is a headache who don't suffer it that is not true its more than that ask some migraine sufferers.